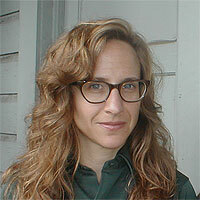 Amy Miller was the coordinating producer for three seasons on KQED's Emmy award winning art series, Spark. She was also a segment producer on another Emmy award winning KQED series, Independent View, which profiled pioneers of independent cinema. For 10 years, Amy served as executive producer and host of RadioSegue, a radio interview show on 90.3FM KUSF in San Francisco, which chronicled the lively arts scene in the Bay Area. During this time, she also helped to develop the KGO-ABC film series, FilmTrip, on which she appeared as the independent film correspondent. Amy works as a freelance producer and production manager for independent feature films (Cherish, Wilderness Survival for Girls) and national cable networks (ResidenSea: The Floating City for The Discovery Channel). She recently produced a series of American documentary films for the Independent Television Service (ITVS) called True Stories: Life in the USA, hosted by Benicio Del Toro. In 2006, the series will be broadcast internationally on public media outlets.